02:00 – EB was not immediately identifiable as a champion. Started at 6 but began competing at 9 and excelled at some events while finding others challenging. 02:30 – Chose gym over figure skating, because she could compete year round at gymnastics and got cold easily. 03:00 – EB addresses stereotypes about female gymnasts – athletes are now getting more mature and taking longer to develop skills as the sport advances. As gymnastics gets harder, conditioning and experience become more valuable. 04:30 – You never realize your peak – as you age, you connect more with the personal journey of gymnastics and realize your own potential. 05:15 – Gymnastics is incredible as a learning experience, realizing potential for your body (gymnastics is very hard for inexperienced people) and there are so many open-ended skills to learn and improve upon. 06:45 – Ellie is always in the gym, a few hours per day for body conditioning as it is important to keep up. 07:30 – Mental training is extremely valuable as gymnastics is very competitive, can be scary, can be dangerous. EB sees a sports psychologist regularly, learns to visualize and gains tools to advance mentally, and be prepared for the stressful parts of the sport. 08:50 – Positive visualization is a skill to learn, and really helps. 10:30 – With injuries, prevention is important in practice, like using soft mats during training. Injuries can also happen by accident or from overuse, so it is important to keep conditioned. 12:00 – EB and Bruce do a play-by-play of Ellie’s events. Beam has a tiny margin of error which is why no one athlete dominates the event. EB loves the performance aspect of the floor event. Confidence is key to success. 13:00 – EB begins vault with a visualization. A good landing always feels amazing. 13:45 – 2013 Commonwealth Games was a breakthrough competition for EB. Toronto Pan-Am games following that was also an amazing and shocking experience, as she won five medals as an All-Around athlete. 15:00 – EB wanted to win redemption for Canada when she placed fifth in the Olympic All-Around events. She believes fifth was the best outcome possible, because it is so difficult as a Canadian to compete against China, Russia, and the USA. So, to be a top 6 athlete is incredible. 17:00 – EB always feels Olympic pressure. It is such an accomplishment to even qualify, that the only thing to do is try your best. 18:15 – Placing silver at the World Championships is unbelievable. EB feels she had to work harder at the All-Around events because there were parts she wasn’t as skilled at. 19:15 – EB is aware of her own confidence – each competition is different, but the goal is always the same. 20:45 – EB loves gymnastics – she is not ready to be done with it yet – she is not finishing soon but remaining aware of where her body and mind are. 21:45 – EB loves to educate and inspire kids through the future hall of famers education program. Helping them set goals and learn to work hard is very fulfilling. She tries to show that having big goals also means struggling along the way. 23:00 – Time Management was important from a young age. With school, education, training, treatment, media, sleep, food, and life in general, EB has a packed calendar. 24:15 – EB can’t do gymnastics forever, so she has to set herself up well for life. 24:30 – Ellie’s trainers are her support system – brought her good advice, help, and confidence. They are always supportive alng with her parents, friends, and family. 25:00 – Bruce Rainnie concludes the interview. End of recording. Description: One digital video file, mp4 format, colour video with audio. 26 minutes and 21 seconds of footage, 1.84 GB in size. 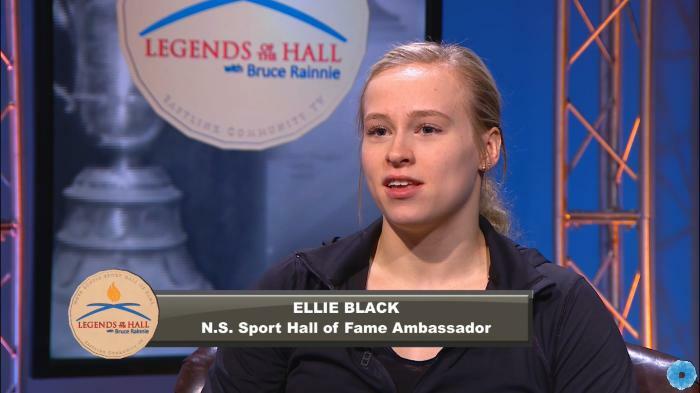 Host Bruce Rainnie interviews Ellie Black for the Legends of the Hall program on Eastlink TV.